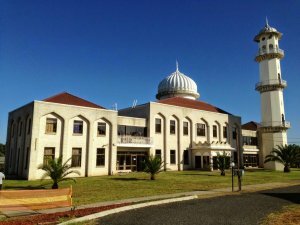 The tragic attack against two mosques in the city of Christchurch in New Zealand has touched the hearts of millions around the world, and stands as a harrowing reminder of the uncertain times in which we live. A National Remembrance Service was held two weeks after a gunman killed 50 people and wounded dozens of others, showing how the country has responded to the act of hatred with acts of love. It is a sad reality that attacks against places of worship are common, and none are exempt, whether it be a church, mosque, temple, or synagogue. In October last year 11 people were killed outside a synagogue in Pittsburgh; 311 worshippers were killed in November 2017 in a mosque attack at Sinai; a First Baptist Church in Texas was targeted by a young man who killed 26 people, to name a few. And, while the Muslim community heals, many are wondering what could have been done to prevent the attack and exactly who is responsible for protecting places of worship. The answer is: everyone. Police, security agencies, individuals, religious leaders, and the government. Soon after the attack, questions were raised as to the standard of the police response. People were frustrated and confused as to how police failed to intercept the gunman before he moved on to the second mosque, killing another seven people. Many experts have suggested that the New Zealand police were simply not properly trained to respond to terrorist attacks, and failed to treat the incident as such. Dr Allan Orr, a counter-terrorism and insurgency specialist, explained that from a law enforcement perspective the police response was fair, but from a counter-terrorism perspective it was “agonisingly slow”. Dr Orr pointed out that “this was the first [terror attack] in New Zealand and it got hit hard. You can understand why the response was conventional from a law enforcement perspective…but next time, there’s no excuse”. Following this, Prime Minister Jacinda Ardern announced a Royal Commission of Inquiry into New Zealand’s security agencies, analysing what the agencies – including SIS, GCSB, Police, Customs and Immigration – knew or should have known about the terrorist, and how they responded. This attack demonstrates the importance of police readiness for terrorism, and the need to develop specialised responses that are quick, efficient and flexible. More specifically, police must be attuned to the intricacies of places of worship, recognising issues such as crowding, the attitude of openness, the lack of funding for security and the lack of focus on security. Law enforcement and security agencies have a responsibility to predict these attacks to the best of their ability through stringently monitoring and by constantly refining their training methods and response procedures. Governments are also responsible for ensuring places of worship are recognised as targets, and have the resources to protect themselves. Since the Christchurch attack, the Australian Government has boosted its Safer Communities Fund and prioritised funding for religious schools, places of worship and religious assembly. The grants, which range from $50,000 to $1.5 million, are to be used on safety enhancements such as CCTV cameras, lighting, fencing, bollards, alarms, security systems and public address systems. There is also an opportunity – arguably a responsibility – on behalf of religious leaders and worshippers to do the most they can to protect their places of worship. They are not defenceless; indeed there are various strategies that can be implemented, ranging from the non-intrusive to the restrictive. In 2017, ASIS International’s House of Worship Committee developed a best practices guide for religious leaders and worshippers of all faiths, highlighting the need to “consider threats and be ready to respond in a quick, efficient, and effective manner”. Today more than ever there is an unfortunate yet palpable need for religious organisations to take security into their own hands, to put it on the agenda and dedicate resources and time to its implementation. The guide breaks security down into three sections: interior, exterior and procedural. The first involves typical security measures such as CCTV cameras, locking systems, authentication procedures for visitors and guests, staff patrols and even body scanners. While worshippers often balk at such obvious restrictive procedures, they are a harsh reality to at least consider. The most interesting suggestion was the implementation of a “welcoming committee” as part of an exterior control. These are groups of individuals who are trained in security detection and response and then positioned outside the building to welcome and interact with entrants, which is a much less interruptive procedure and could have a huge impact on the detection and notification of attacks. The application of external controls is, in many ways, the most important consideration; a 15-year study revealed that over 70% of violent crimes at faith-based organisations occurred outside the building, on ministry grounds or parking lots. Other external measures include the use of Crime Prevention Through Environmental Design (CPTED) principles, such as utilising natural berms, plants, trees and rock formations in order to enhance perimeter security and mitigate vehicle access. Document any descriptions of suspicious people or vehicles. These are some of the methods that religious organisations can consider when handling the security of their places of worship. It is imperative, regardless of the size, location or beliefs of the congregation, for all places to enhance their security and determine what is appropriate for them. While many security measures should of course be supplemented heavily by agencies and police, it is important for worshippers to take security into their own hands to an extent and stand up for their right to safely practice their religion.